Make classic roast chicken even better by starting with seasonings under the skin and finishing with a delicious sauce from the pan juices. “Good roast chicken will never let you down,” says my grandmother, and Lucia and I definitely agree with her. With its crisp, salty skin, moist breast meat, and dense, meaty dark meat, a whole roast chicken appeals to everyone from a sophisticated diner to a finicky kid. Which is why it makes the perfect Sunday dinner. Getting any two good cooks to agree on how to actually roast the chicken is another story, however. Do you use high-temperature, fast roasting? Or should you take it low and slow? Truss it tight or leave it loose? Baste? Yes? No? We tried several methods to really explore what worked best, and while we acknowledge that there are indeed many ways to make good roast chicken (click the link for dozens of Roasted Chicken recipes), we’ve developed a method that we think is simple, yet which gives us delicious results. We start with an initial blast of heat, followed by roasting at a moderate temperature; we don’t truss, and we don’t baste (except for small birds). We do pay careful attention to the first and last steps of the process—we season the bird to make it even more flavorful, and we always like to go one step further than just plain roast chicken by transforming the flavorful pan juices into a simple but delicious sauce. 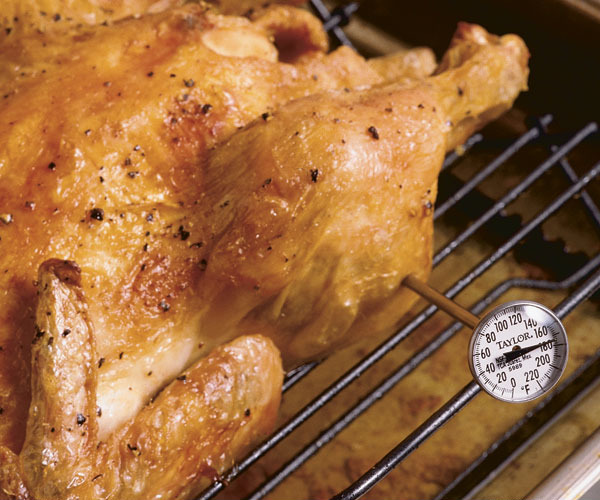 Web extra: Get our five quick tips for perfect roast chicken. Chickens labeled “roasters” are generally older and larger (up to 5 pounds) than “broilers” or “fryers.” We think roasters make the best choice because they’ve developed more muscle tissue and they carry a thicker layer of fat (which cooks off). 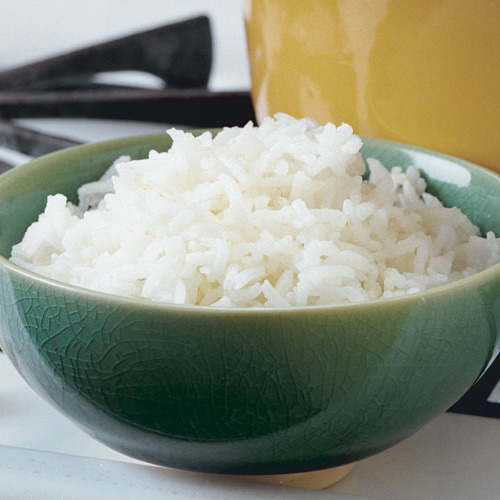 Put simply, they’re more flavorful. We usually choose organic, free-range chicken when we can, and while making generalizations about them is tricky, we’ve noticed that the free-range chickens tend to have bigger thighs and slightly smaller breasts than regular mass-produced chickens. They also tend to be slaughtered later and so they’ve developed a fine layer of fat and muscle tone, all of which enrich flavor when roasting. We’ve found that free-range chickens tend to have a firm, not mushy, texture, and they taste more like, well, chicken. The simplicity of roast chicken is part of its appeal, so we don’t like to clutter it up with lots of ingredients and fussy steps, but we do like to give the bird a nice flavor boost before roasting. Usually we’ll just use butter and seasonings, but for a change we might marinate the whole bird. For a basic approach, we rub the outside of the bird with softened unsalted butter, which encourages browning, and we work some butter and other seasonings under the skin of the breast to help keep it moist and to add some flavor notes to the mild meat. 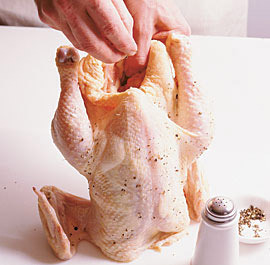 A generous dose of salt and pepper both outside and inside the bird’s cavity is important so that the seasonings can be absorbed into the meat during roasting—more effective than trying to season the surface later. We also usually put other flavor additions into the cavity—herbs, lemons, cloves of garlic—which help flavor the meat and especially the pan juices as they flow from the bird into the roasting pan. Trussing seems time-consuming–and a little counter-productive. Trussing keeps the drumsticks and wings close to the body so that the skin on the interior part of the breast as well as that inside the drumsticks and wings doesn’t brown well. And getting the delicate breast meat and the denser dark meat to cook at the same rate is already an issue in roasting, and trussing can make the dark meat take even longer to cook. We do like to use a V-shaped rack when possible, which cradles the bird and holds it up higher off the pan than a flat rack (or no rack at all). This lets the hot air circulate under the bird so that it browns entirely — no more flabby chicken skin on the back side. 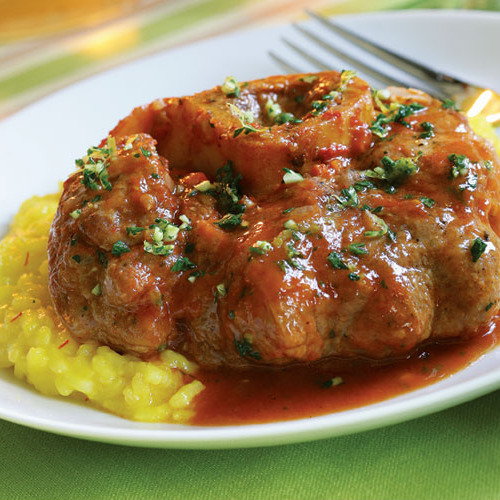 By lifting the chicken up, the juices hit the pan and evaporate into a rich, caramelized layer (the intensely flavorful base for your sauce), leaving the fat as a layer that can simply be poured off. 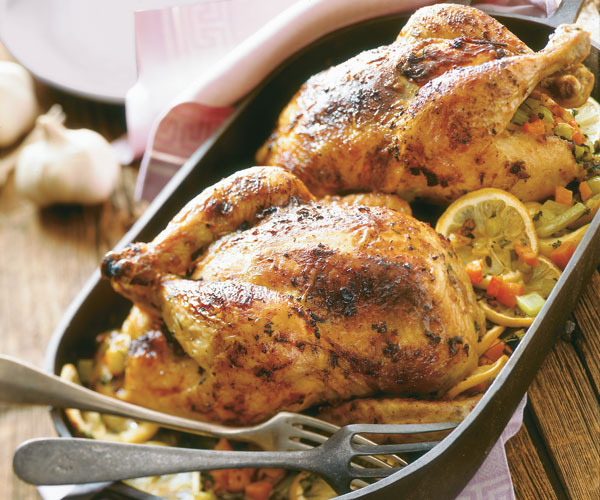 We’ve found that when setting the chicken on a flat rack or directly in the roasting pan, the juices that collect around the chicken never have the chance to reduce. 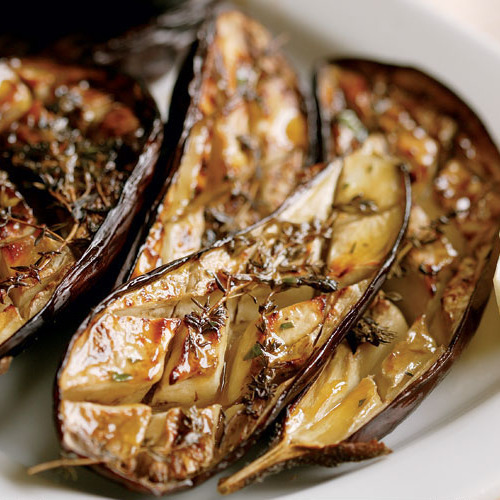 Though flavorful, they aren’t caramelized so they’re not as rich tasting, and they’re mixed with the fat, which makes degreasing difficult. A blasting heat crisps the skin and gives the chicken a great roasty flavor, but we recommend just an initial 15 to 20 minutes at 450°F, followed by a more moderate 375°F for the remaining cooking time. 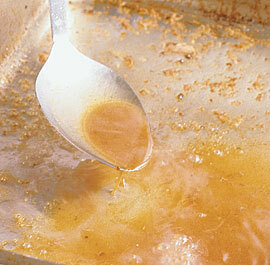 High heat throughout cooking works, but the fat spatters a lot, making a needless mess. If the heat is too low, however, the skin never really develops that lovely crispy brown and the meat tastes too bland. 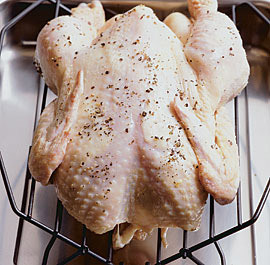 As for basting, larger birds are fattier and don’t need to be basted; we only baste birds that are under three pounds. 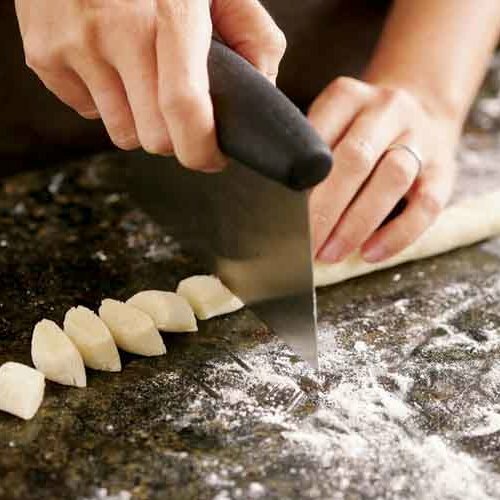 Ovens vary and so do chickens, so cooking times in the recipes should be guidelines only. You also need to consider the amount of other ingredients in the pan; for example, our yogurt-marinated chicken with mushrooms takes a little longer because you’ve got two pounds of mushrooms sharing the pan with the chicken. The important thing is to learn the signs of a fully cooked chicken. We don’t like overdone birds, but unlike red meat, the flavor and texture of chicken don’t benefit from undercooking. Our tests for doneness start with color. The skin should be dark golden, and the juices that come from the thigh when you prick it (and also from the cavity when you tilt the whole bird) should be clear, not rosy. The drumsticks usually wiggle easily in their sockets, though it’s sometimes hard to get a good grip on a hot bird. The ultimate test you should use until you’re really experienced is to stick a thermometer into the middle of the thigh meat, not too close to the bone nor too close to the skin; it should read 170°F. Hurry up and wait. The next step in roasting may seem counterintuitive: you pull your golden-brown bird hot from the oven and you want to rush it to the table. Don’t. The chicken will be much better if you let it rest for 10 to 15 minutes. This lets the juices redistribute themselves. We actually prop up the chicken, backside up, to let the juices run into the breast meat. 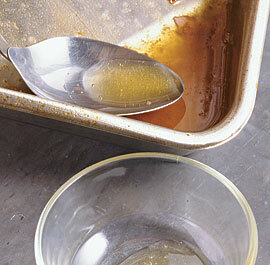 The 10-minute rest also gives you time to degrease and deglaze the pan and to finish your sauce. This is always our final step in roasting a chicken, and one that we think too many cooks overlook—making a sauce from the pan juices. The crusty bits that cling to the roasting pan are like gold: concentrated nubbins of roast chicken flavor. 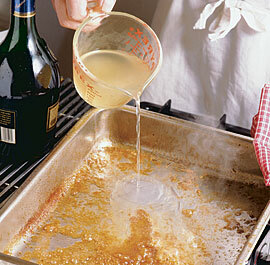 We pour or spoon off all the fat (don’t go crazy and try to get every drop: a little residual fat won’t make your sauce too greasy, and chicken fat tastes good) and then add some liquid to the pan to melt the caramelized juices, forming a thin, shiny veil that covers the pan. We add some stock, reduce it, add a little more, and then reduce that to a silky sauce, thick enough to coat the back of the spoon. 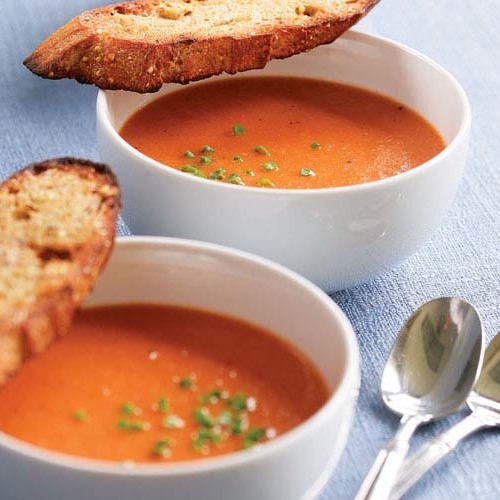 If you like, you can reduce just once, but we like the double reduction technique because it seems to create layers of more complex flavors.